Bell recollects the house where the men in his squad died in Europe. Behind the house there was a trough that someone had chiseled out of a rock. He reflects on the fact that someone had sat there and chiseled away at the rock, which would last 10,000 years, and wonders why. He wonders if the man who did the chiseling had faith. The only thing he can think is that there was some kind of promise in the man’s heart. Bell wishes he could make that kind of promise. After retiring, Bell continues to struggle with faith and his choice to retire. Bell uses this as a metaphor for his work as a sheriff. The permanence of the rock depicts the way in which the labor of the past can continue into the future. Bell is beginning to accept that he did not have the fortitude to bring Chigurh to justice. Bell notes that in his telling of his story, he has not done his father justice. He is older than his father was when he died, and in a sense he is looking back at a younger man. His father was a horse trader, and was good at breaking horses, but Bell notes that his father never broke him, and he is grateful for that. By the world’s standards, Bell would have been perceived as a better man than his father, which has been hard for him to live with. He realizes he has thought of his father less than he should have. Bell continues to compare himself to his father. As an older man, he has the perspective to see his father’s life in a new way. Society would view Bell’s work as a sheriff as more important than his father’s work as a horse trader, but Bell understands that the way society views his work gives him undue respect, without taking his character into account. His father, despite his job, was a moral man, and Bell respects and appreciates him for it. Bell had two dreams about his father after he died. He doesn’t remember the first dream well, but he remembers that in the dream his father had given him some money, but he had lost it. In the second dream, he and his father are back in the old days. Bell was riding through the dark on a horse. It was cold and there was snow on the ground. His father rode past him carrying fire in a horn the way people used to in the old days. In the dream, he knew his father was going ahead to make a fire somewhere out in the dark, and Bell knew his father would be there when he got there. Then he woke up. Throughout the novel, Bell has struggled to live up to the high standards he sets for himself. These standards are based on the lives of his predecessors, primarily his father, which leads to the presence of his father in his dreams. The first dream suggests guilt around his lack of responsibility in connection to WWII and in his role as sheriff. The setting of the second dream (“in the old days”) shows his longing for the past. While the dream points toward Bell’s hope for the future, he does wake up, leaving the reader to wonder if his hopeful dream will come true. Powers, Jacob. "No Country for Old Men Chapter 13." LitCharts. LitCharts LLC, 3 Aug 2015. Web. 21 Apr 2019. Powers, Jacob. "No Country for Old Men Chapter 13." LitCharts LLC, August 3, 2015. 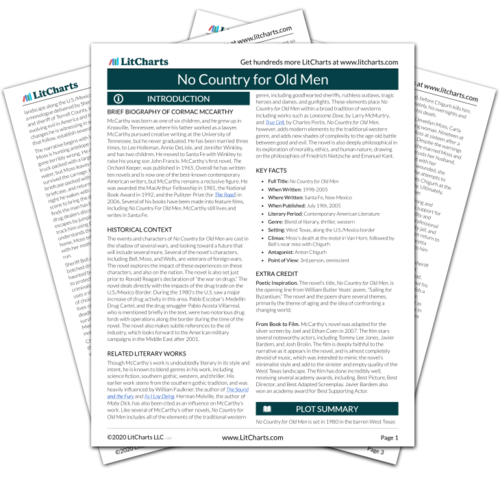 Retrieved April 21, 2019. https://www.litcharts.com/lit/no-country-for-old-men/chapter-13.